C is for Cool; Too Cool for Space School! P is for Perfect Parcel! News, Views Etc . . . Stop Press! B is for Blame Chris Smith! AFV is for Among my Favorite Vehicles! T is for Two - TAT's Tankette! O is for Odd's & Sod's in Olive-drab! S is for Scott's Squaddie, Sculptures - Singular! T is for Two - Wheelers! Q is for Query - Coca-Cola Animal Flats? T is for There Goes the Neighbourhood! T is for Toy Fair '18 - Esdevium Games . . . Not! N is for New Camera! C is for Clue . . . Doh! H is for Hiding . . . in plain sight! T is for Thoughts for the day! RDA is for A Sort of Follow-Up! B is for Because I Had Them Out! K is for Kleeware's Komic Kop Kar! P is for Pak-Me-Mee's Powdered Pudding Players! It's another space-taaaaannnnkk! 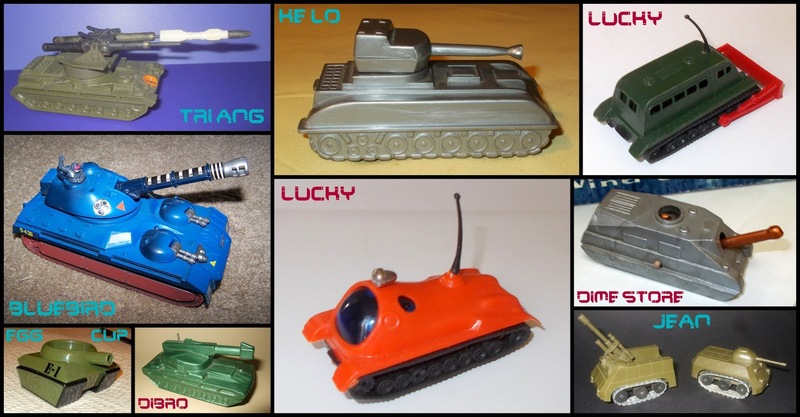 We love space tanks here at Small Scale World; to misquote one of those Georgian ladies, it is a fact universally recognised that you can't have too-many space tanks at one Small Scale World or not find yourself in need of another space tank . . . or two! The right way up this time! How cool are these . . . oh, yeah! I've done that! They're squat, they're heavy, they're ballistically protected, they're mean looking; they might be Kaled? Supplied by Waltii Industries*, they appear to have two smoke-generators either side on the sloping armour, but they might be retro-upgrade, killersonic audiodeath-weapon, speaker-covers? There's a large hull-mounted kenetik-kannon to the right of the turret which is itself, equipped - of course - with a death-ray! And six hypersonic, depleted-uranium rod, multiple-warhead, rocket-launching tubes lie behind the low-profile turret. There's a small automated MG cupola atop the turret and a forward-firing .50-Cal! Of course there is; .30's, .50's, MG3's and GPMG's will be widely used across the five galaxies in 2525, due to their reaching the pinnacle of small-arms development in the 20th century back on Old Smokey, called that because in 2525 'Terra' will still be smouldering from its man-made demise, five-millennia earlier! 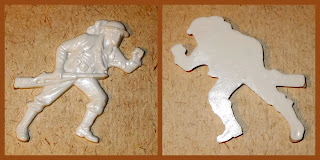 Both were in the plunder pile from Chris Smith and I've posed them with a figure from the same lot, he's one of the little polystyrene Italian-made troops later copied in soft polyethylene by the Spanish sobre issuer Montaplex. While both have been on the Blog, I don't think we saw a complete grenade thrower? His helmet is half rebel-ship troops from Star Wars I - The Start Of The Franchise and half beegly-beegly (or whatever the hideous little robot-boy was called) from Buck Rogers in the 25th Century - R2-3PO-and-a-half? Now - the 'unknown' bit. 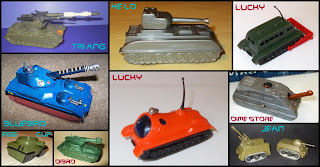 I wondered if they might be old soviet-era toys, but they have certain elements of Hong Kong about them too. Chris used to carry a lot of Eastern toys but his thoughts are as mine, he says he had them in the Russian zone of his collection but moved them to the Hong Kong section! As HK usually marks something this size and the Russians would normally have a Ruble or Kopek price engraved in them somewhere; the fact that there are no obvious markings anywhere leaves us still firmly in the dark! We have two stars on the port hull side, astern, to go on, they don't help either as the Russians and Americans both use stars, HK would liberally place stars on war-toys, as did the Soviet toy makers! One - I think I have a little turret in the spares box, which probably came-in with a bag of HK stuff when I was a dedicated small-scale collector. Two - the .50-Cal! And Three - the track-guards/side-skirt armament/plates are more Gulf-war Challenger add-on . . . than Dalek! 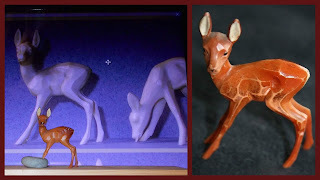 Suggesting an influence on/by the sculptor which precludes (post-cludes?) excludes (!) the Soviet era, therefore I suspect they came with some of those rack-toy copies of Galoob Space Marines (or something similar) and probably a dinosaur or two! Can anybody confirm one way or the other? But they are brilliant, for cheapies - whoever made them! *Remember space-generals - Other space tanks are available and the human cost of intergalactic war can go up as well as down! 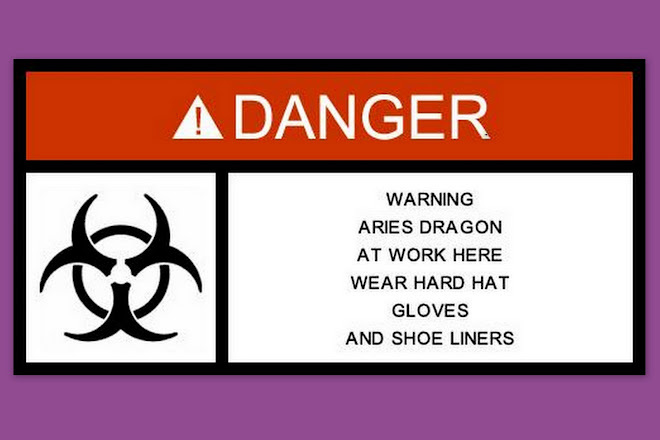 Failure to adhere to the scheduled maintenance program could affect your space tank's warranty. Your planet is at risk if you do not keep-up repayments on your space tanks. Waltii Industries reserve the right to pass your customer details to affiliated .50-Cal salesmen, Kaled envoys or the enemy! Any killersonic audiodeath-weapon technology retro-fitted could affect the mental state of the product's crew, for which Waltii Industries accept no responsibility. Waltii Industries after-care package is; we don't care, go, pink monkeys; kill, destroy. Labels: 1:76 - 1:72, 25mm, 28mm, AFV; Tank, AFV's, C, Contribution, Plymr - Ethylene, Readymade, Space, Unknown, Waltii Industries! 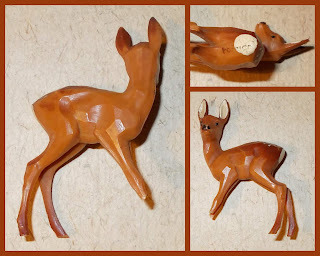 You may remember that Colin Penn kindly send some images of his Vitacup animals to the Blog a while ago now, with some I hadn't posted, one of which I called - at the time - a "gazelle/deer (with curved horns)", well I now know it was issued as an Impala . . .
. . . and Chris Smith sent me one the other day! Both horns intact which is the trick with several of these 'Ivorene' polystyrene animals, who are both quite robust and brittle at the same time! And - in my defence, I did call it an Impala in the first post, so why I was so vague the next time I don't know! I have also said - in the ever-lengthening number of Vitacup posts here at Small Scale World - that I believed there was a painted set, or painted versions, and a damaged one of them was also in the lot Chris sent. Now, it has 'Foreign' on the base which is usually a sign of it being German or Japanese from the 1950's/60's, Hong Kong stuff tended to bang-on about 'Crown Colony' back in the early days. While the temptation is to think Japan (due to its similarity to HK) I wonder if it wasn't actually German. We had several similar pieces as kids, which we got in 1960 from some hill on the Rhine in Germany (I've mentioned before here), the home of the gnomes? Anyway, they were gold-chromium plated with little plinths and plastic-jewel lanterns etc . . . long-gone now, sadly. I further stated in one of the early posts on Vitacup that "There are two distinct sculpting styles; a realistic look, which is most of them, and a stylised 'carved' effect..." This deer and several of the other animals are in that style. Another one on the right, cropped-out from the feebleBay, it has no white spots on it's rump, while mine is compared to the bare one on-screen. I now don't believe the painted ones are Vitacup, but that Vitacup sourced some of their range from the moulds previously used for tourist novelties . . . and possibly German (or Eastern European; Czech?) moulds at that? That was going to be the full extent of this post, but I was on a roll! 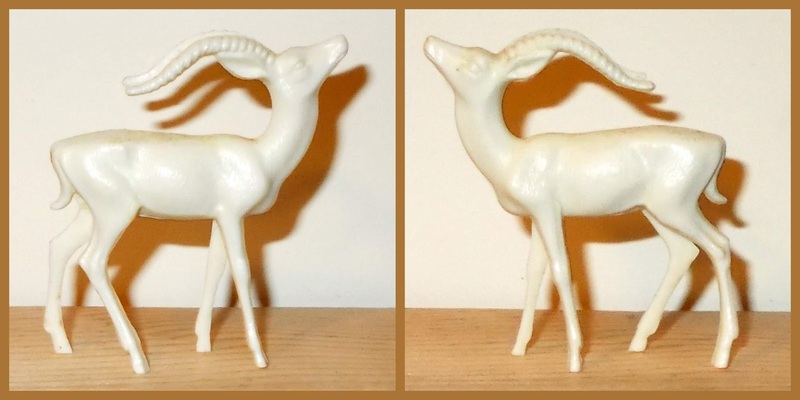 There are in fact six deer, the three above which are quite common, in the carved style and bough-in or otherwise outsourced, and the three below, far less common and possibly from the last set (see below) Vitacup issued, they are - obviously - more realistic sculpts. 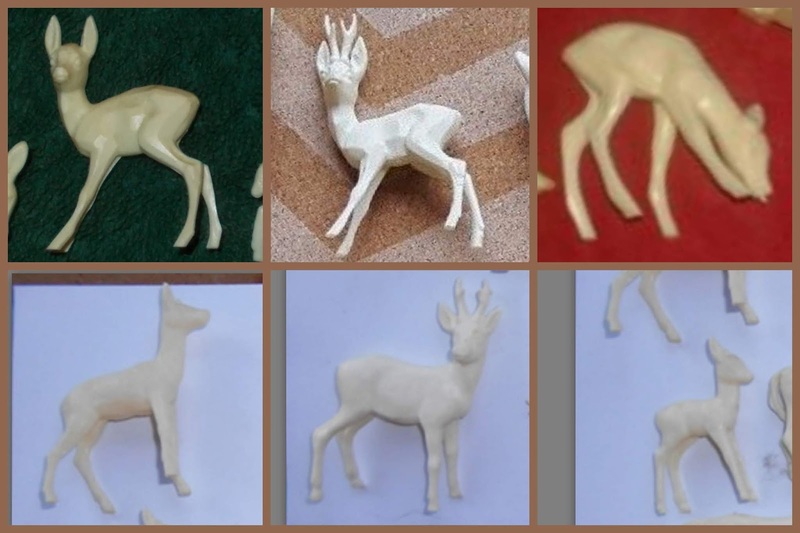 We have looked at the horn-addition phenomena before, but it's interesting to see on the [later] three others a male (reverse pose) a female and a smaller fawn, with the common ones they are all the same size and two are the same sculpt, but they fill the same roles? Suggesting the source of the previous [tourist novelty] poses had dried-up? That's enough deer dear; trying to get a definitive 'head-count' from the evilBay lot these pale blue ones are cropped out of, led to question marks of what is actually a Vitacup sheep and what isn't? The lamb with inner-flat legs is very Vitacup (the baby elephant is very similar) but seems to need a base, yet; not to have had one, while the sheep (bottom left) may be a soft-plastic infiltrator to another eBay auction lot. 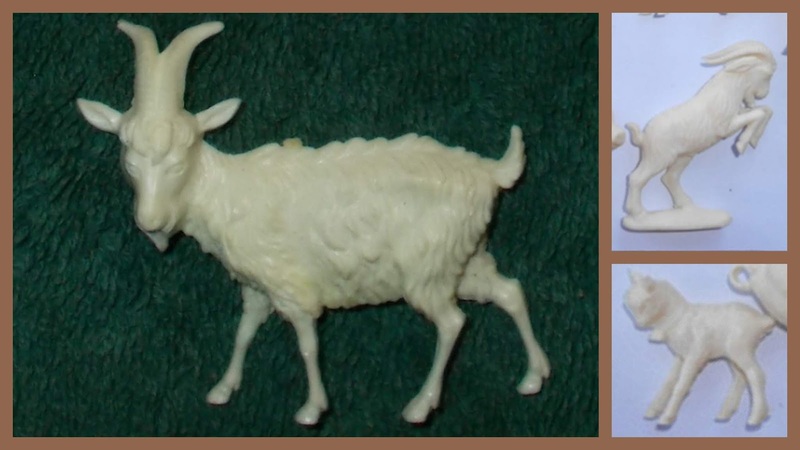 The common goat seems to have been replaced - like the deer - by a similar species (is it a Chamois? Cheviot?) in a new leaping-pose, along with a little kid, fitted with a small bell on a collar. 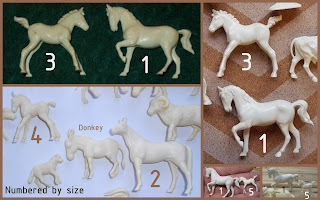 The horses also suffer from redundancy in what I think was the last issue, with a new halter'less adult (2) replacing the older one (1) and an almost identical foal (4) replacing the earlier sculpt (3), but while the early one was the same size as the horse almost, the new one is smaller, yet there is a smaller one still (5) in the common sets, a copy of 3 but with a bent leg? 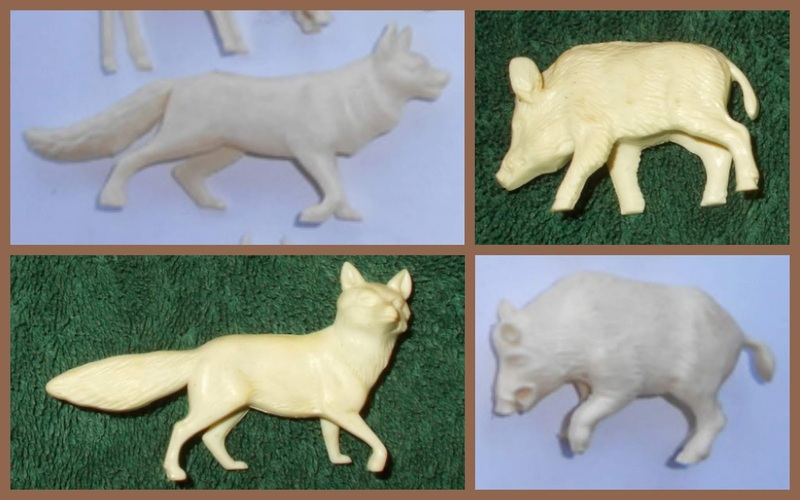 Is it (top left) a wolf, a vixen or just a replacement 'fox'? For a while I thought it might be a corgi-type, but with a big tail! It might be an Alsatian hound? 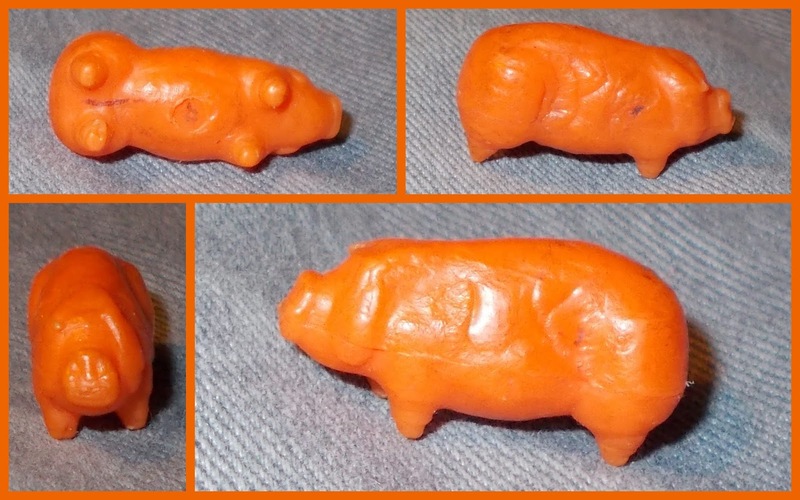 The wild boar also seems to have had a late update. Speaking of dogs, they have risen to five (six if the foxy-wolf is an Alsatian! 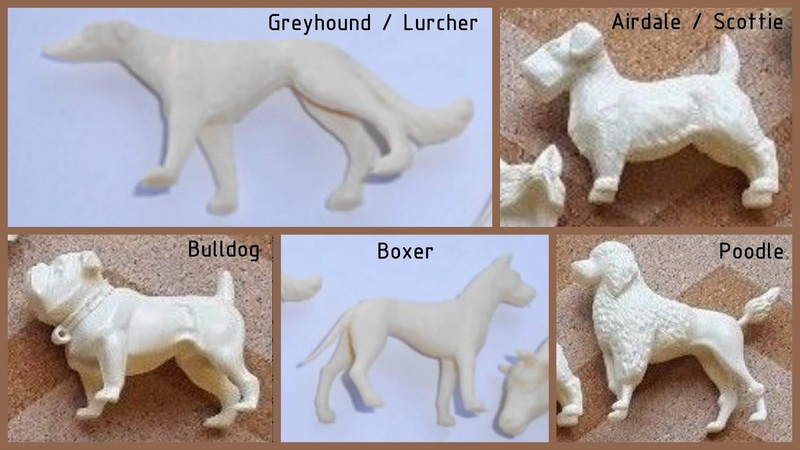 ), with the addition of a racing-dog and a boxer (Dobberman? Rotweiler? ), note also that the Internet bulldog doesn't have the painted collar he is often found with. Studying them on the internet can lead to a belief or suspicion of two alternate rhinoceros sculpts, but I think there is only the one, it's just that it can lose a lot of fine detail in low-resolution images and appear quite different. 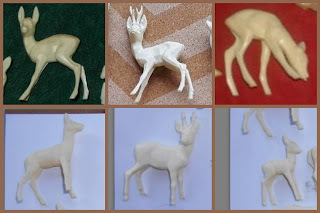 I suspect we are looking for a total of 52, broken down into 3 issues of 12 animals per issue being - each time - a mix of farm, woodland, wild/'zoo', birds and domestic pets (including the common sculpts and both versions of the ['bough-in'] deer), and one late issue of 16 less common animals, all pets, farm or woodland. 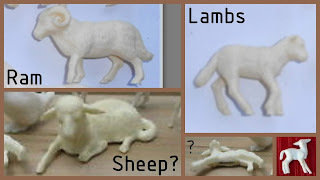 My current totals are a minimum of 53, or a maximum of 55, if we lose both of the two question-mark sheep and one horse, it adds up? But I bet more turn-up! We will - clearly - return to Vitacup here again; before it's all told. Chris Smith was a sneaky-beaky! He had arranged to send me some Tatra / Nabisco / Kellogg's / Peak Freans / All-points-West toy soldier premium swaps he had along with a handful of Vitacup premiums . . . but sent a huge pile of stuff! And while Small Scale World needs constant feeding with piles of stuff, it was a very kind gesture. And - with similar donations from 'Sandown' Jim and Mr. Burke in recent years a humbling thing for which my gratitude never seems to do justice to the act? Thank you Chris, and thank you Brian and Jim. Mostly the bits I was expecting to receive, with a couple of the larger pieces from the other parts of the parcel. I will have a big sort-out of all the Tatra when the rest come out of storage and do a more definitive article with everything that's come out since the first, rambling and increasingly inaccurate post. The two tanks are upside-down for a reason - their own post! They're so cool folks, so very, very cool, they're cooley-cool - I say so! The motorbike is an odd one; it appears to be an unmarked, yet reasonably accurate copy of the Britains Harley Davidson [coming to a dealership near you, from somewhere other than Milwaukie soon!] Police Sherriff Electra-Glide (? ), with a soft vinyl copy of the CHiP's-like rider, but with a polystyrene head and plug-on German helmet? I say 'appears' as I don't have the original to compare with, but I'm pretty sure they were marked Britains on both the engine underside and the tyres, this in totally unmarked, and while the Britains one was maybe a half-dozen parts (less wheels) this would be only three with the missing seat. Zee, Play-Me? Someone like that! And I will look out for a cheap Britains one so I can compare them in a future post. We'll see him again before that in a M/C roundup already in the queue. Equally interesting is the cart, which I think has the Blue Box hay-box on it, but the frame is a heavy, crude silver plastic - almost early British (Taylor or Barratt?) in style - and small wheels which may not be right, but fit? We'll definitely return to it one day when we look at them all together . . . it's the same silver as some Trojan Wild West? And then there was all this which Chris never mentioned! We're about to look at some of the highlights below, but what can you spot . . . there's Waddington's, Dinky-Corgi-Matchbox-Spot-on accessories, Supreme, Airfix, Blue Box, Britains Mini-Box, Gem, Miguel Torres and various premiums for a start! Does anyone know the origin of the black duck - or goose? I have him in red (and white now I think?) and may have a chicken in the same style, but no other animals, so I wonder if they are from a board game? They are a bit like the American Judy Toys geese (the Judy duck is smaller) on Kent Sprecher's website, but not quite the same. The two statuettes appear at first glance to be 'T-in-a-Circle, but it's actually a T in a C - I think, and Japanese not HK? They will join a Santon follow-up from Brian B which has been on hold since January! Which reminds me - I put a plaster civilian away without photographing it the other day, that'll go with them, too! And it's not actually a 'Santon' follow-up because they're mostly Italian - doh! 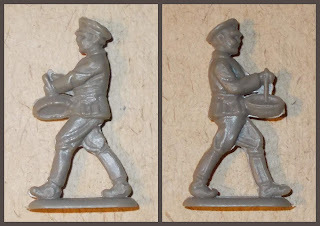 This is lovely, I can't decide if it's a US WWI Doughboy, with large-pack/marching-order, or an Italian Bersaglieri with plume and that sort of felt bowler-hat they had back then, I favour the latter and to be honest - while it matters for the origin of the flat - it wouldn't matter for painting-up, as it will make either; most convincingly. I wonder if he has avoided the addition of a clip-pin of some kind and is actually supposed to be a badge? 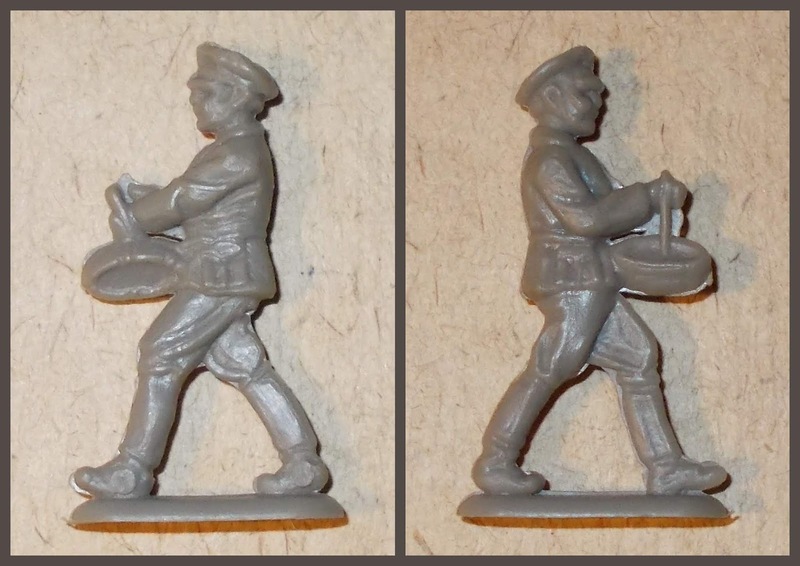 If he wasn't so clearly 'non-German' (from either war) you'd suspect a Wintershilfswerk piece, especially as he is in the same kind of polystyrene. I've collaged these two together, as I suspect they go together? But they might not, both have similar paint and both are hard polystyrene kit plastic, but the fire has no 'scale' so it's hard to judge. The figure is about 40mm and a single piece (no 'kit' construction) and the painting suggests a factory job. 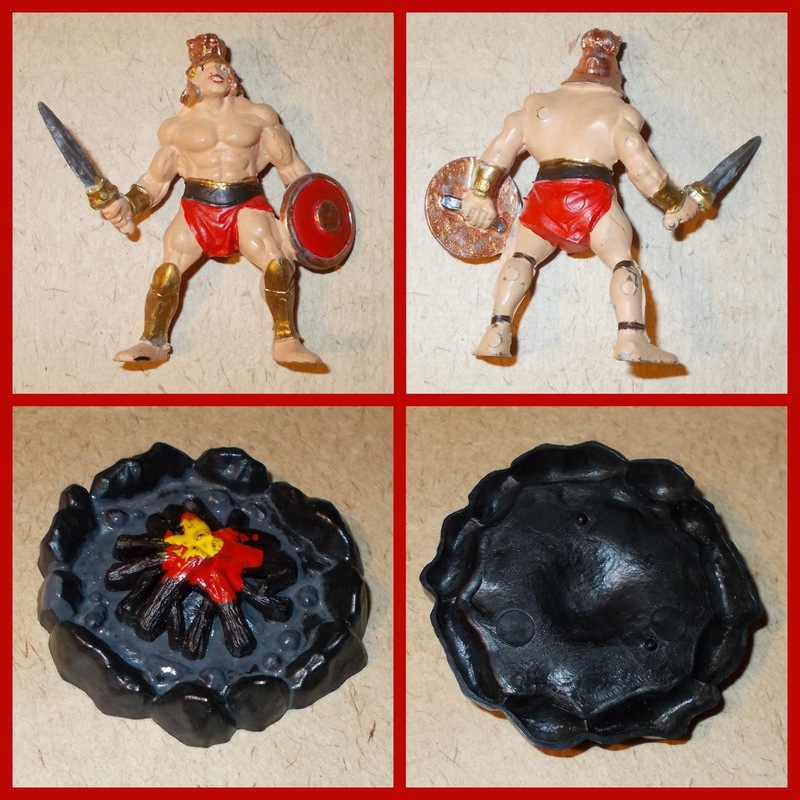 He's silver plastic; the fire's a black polymer. If they are both home-painted you'd go with Aurora or similar monster kits; Revell issued some under their Monogram moniker back in the 1990's? But if they are factory painted . . . well . . . Flash (the remake), Conan . . . He-man? And what; a play-set of some kind - anyone know? He looks a bit like the 'Barbarian' from the Tomy-Pressman et al catapult games! Another flat, 35/40mm soft polyethylene and very-much in the style of the Manurba animal flats, did the zoo have a band? He looks to be Sally-Army or WWI British . . . or even Russian? Lovely thing to get in the post, without warning! This was initially put in the bag with the other five cats which have come in over recent weeks (two others in Chris' swag-bag, one from a charity shop bag, one from Sandown!) for a future round-up on the back of a set which also came-in, as I thought to myself "Ah, French-issued vinyl from Macau! Poly-someone?" but it looked familiar, so I got the jewellers loupe on it to find "Made in England", I then spent an hour or so thinking it was Timpo, and wondering who made Timpo in PVC/vinyl? Thinking I was being silly, I decided it must be the Taylor and/or Barrett one, probably made for Barton's dolls houses or something/someone like that? Only . . . double checking with the dongle 'archive', it's not T or B, it IS the Timpo one? Code 1090 (? ), I guess the doll's house accessory bit stands, but who produced off the Timpo tools in PVC, could it be a Toyway thing? Of course it could be a Macau piece, pantographed so well the remains of the lettering have been carried across, but it's a bit soft for the maker I'm thinking of, I have one of the Poly-whatsit Romans (from Peter Evans) and he's much stiffer? They don't appear to be 'rare', this chap seems to have a shop-stock of them! But the first time I've seen one? This is also lovely; I'm calling him 'Stumpy'! But they are not broken-off, those are his factory designed, factory injected, intact, itty-bitty, little legs! Anyone recognise him? He is most like the hard plastic ones from Tudor Rose, but not the same, he's not Gem either, as far as I can tell and my guess is a farm-vehicle's stock/load from the world of die-casts, or a board game, he's clearly designed not to fall over easily, a board-game could be the answer? 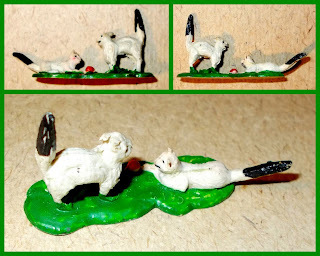 Is there a swineherd version of the shepherd game we've looked at here?!!!! My assistant decided to take her 'statutory' rest-period in the packaging! No fiishy-fiish for you madam; you're slacking - again! Chris - Thank you again, the rest will filter through into, or enhance posts for months and years to come!